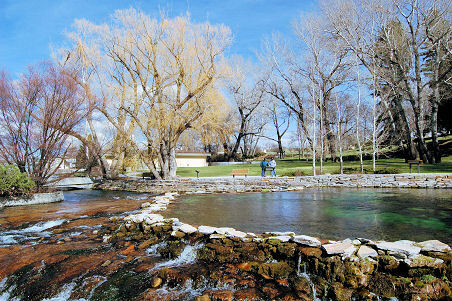 Giant Springs State Park marks the home of one of the most abundant natural springs in the world. Discovered in 1805 by Lewis and Clark during their historic month-long portage through the Great Falls area of North Central Montana, the spring boasts an astounding measured flow of at least 156-190 million gallons of water a day. The Great Springs discharges 156- to 190-million gallons of water a day into this pool which then flows 201 feet via the Roe River into the Missouri River. called "Black Eagle Spring" by the Blackfeet Indians, the spring was recorded by Captain Meriwether Lewis for its striking appearance and size. As he noted in his journal, the spring "boils up from under the rocks near the edge of the river and falls immediately into the river 8 feet, and keeps its colour for ½ mile which is immensely clear and of a bluish cast." Today, the site includes a fish hatchery for rainbow trout and brook trout, an attractive picnic area, walking paths and a visitor center with several taxidermy mounts of animals indigenous to the area. Giant Springs also is the site of the Roe River, officially measured at 201 feet in length and noted as the shortest river in the world. A path leads to the nearby Rainbow and Crooked Falls, two of the five waterfalls that had originally stood in the way of the Lewis and Clark expedition. Giant Springs State Park is located on the banks of the Missouri River, a favorite site for hikers, canoeists and naturalists alike. The area is a haven for at least 80 species of birds, mammals and reptiles and interpretive lectures are provided each summer at the Rainbow Falls overlook. The park is located less than one-half mile from the Lewis and Clark Historic Trail Interpretive Center, three miles east of U.S. 87 on River Drive, in Great Falls, Montana. Water from the Giant Springs is carried by the Roe River running under the foot bridge near center of photo into the Missouri River near Great Falls, Montana. Giant Springs State Park. 4803 Giant Springs Road, Great Falls, MT 59405. Phone: 406-454-5840. GPS: 47.534; -111.227. Official Montana website for kids to find things to do and see in Big Sky Country from the parent company Visit Montana. 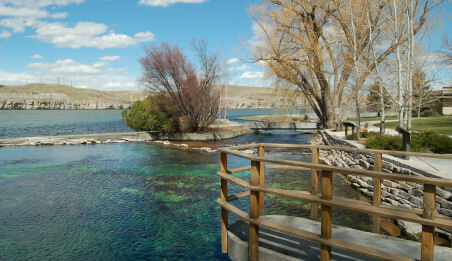 This website features a description of Giant Springs State Park and a map for location and directions to the park. Located in Giant Springs, this company sells bottled water from Giant Springs State Park. Read the history on Giant Springs State Park and find educational opportunities. Once listed as the world's shortest river in the Guinness Book of World Records, the Roe River runs between Giant Springs and the Missouri River.